When there are no plants to be gathered or grown, I satisfy my urge to create by turning my attention away from medicine made with foraged plants to skin care instead. Last week I was in the midst of planning a retreat for local midwives and decided to make some masks for the event so I hit up the shelf-stable natural items in my pantry. Sheet masks are super popular right now and there are also plenty of the more old fashioned tub or tube type spreadable masks on the market. Commercially available masks are full of questionable ingredients. Some brands use all the right words, splashing the names of luxury, botanical or nutraceutical ingredients all over their packaging and advertising, but as a consumer, you should know that only miniscule amounts of these more desirable ingredients are part of the formulation. You can make your own masks at home really easily and you can pack your formula with lots of high quality ingredients for healing and nourishing your skin and avoid all the crap. Every crunchy girl has had the experience of mixing some bentonite clay with a little water or maybe some water and honey and slathering it on. It doesn’t smell that great, but you can just feel that clay as it tightens, tones and draws out impurities in your pores. It gets hard and cracks and then you wash it away. This is the most basic and rustic of all masks and it gets the job done when it comes to clearing the pores, but it’s not hard at all to make masks that are much more sophisticated and approximate the delicious smells and textures of some of the better brands. 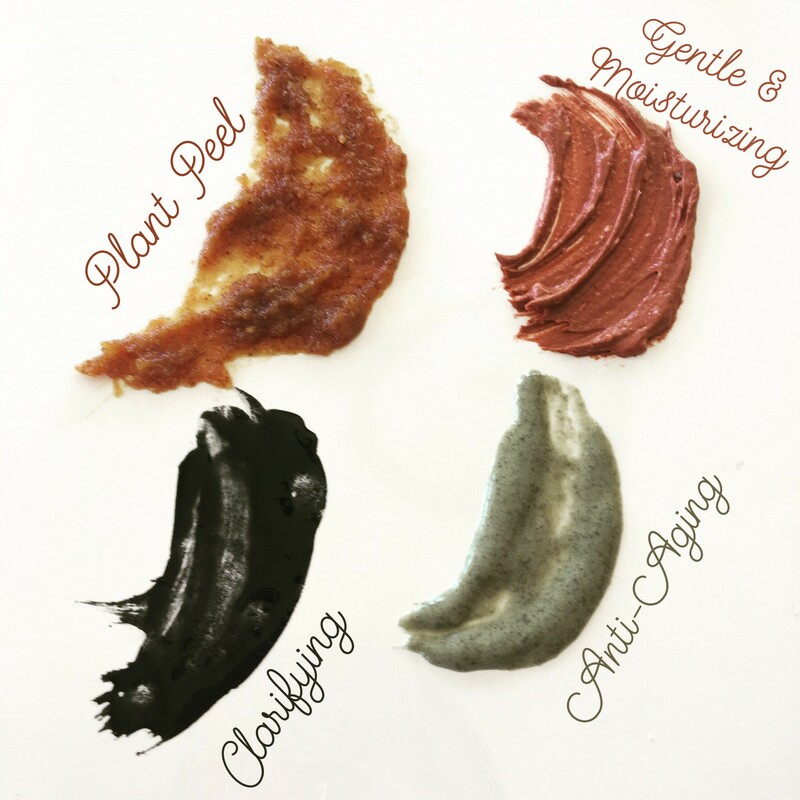 Clays are used in two of my masks because they are so good at drawing out impurities in the skin. Honey is also featured in three of the masks. Honey is antibacterial, which is good for acne and also contribute to longevity of the product so you can make a big batch and use it over a period of weeks or even months. Honey is also moisturizing and soothing, but not oily, and can mitigate the irritation and overdrying from clay or fruit acids. My formulas are below. They can’t be precisely called recipes, because I didn’t measure. I eyeballed my ingredients and sampled as I went along adjusting the ingredients as needed to achieve my desired consistency, texture and scent. All of my mask formulation are designed for good shelf stability, only the Plant Peel requires refrigeration and none will separate. This is a copycat of two of my favorite products, Exfolikate by Kate Sommerville and scrub/masque by Eminence Organics. Fruits are the natural origin of alpha-hydroxy acids, including lactic, malic, glycolic and citric acid. These acids are also used in over the counter, spa and pharmaceutical grade skin care products like serums, scrubs and peels for their anti-aging effect. The generous use of fruits and their natural fruit acids are designed to exfoliate and resurface revealing fresh, clean, clear skin. Pumpkin is a popular ingredient in OTC plant peels, including Exfolikate and is affordable with a nice consistency. It’s rich in antioxidants and Vitamins like Vit C as well as alpha hydroxy acids. I also used acai berry and pineapple mostly because I had them on hand, but they too are rich in fruit acids. You could use other canned or fresh fruit purees or other fruit powders. This mask is tingly! It’s not for those with sensitive skin. In addition to the chemical (fruit acid) exfoliants, it contains natural mechanical exfoliants (the scratchy bits) and you should scrub for 30-60 seconds with this mask before you leave it to sit on your skin. I used a pinch of pumice and some orange peel powder but you can experiment with other exfoliants. This is the one mask featured in this post that should be refrigerated due to the fresh fruits used. Stored in the back of the fridge, with the addition of essential oils and heavy sugar content, it should stay fresh and usable for quite a while. You could also freeze this mask in an ice cub tray and just defrost one or two cubes as needed. I have a favorite and it’s this one. It is the one that requires the most work and fuss but I think it’s worth the extra time because the whipped texture of this mask is divine! But if you are short on time, I’ll describe a short cut below. Glycerin is a wonderful ingredient that is naturally preservative and also moisturizing for the skin and silky. Too much, however, is sticky, so use a light touch. Vitamin E is a good antioxidant that is good for the skin as well as contributing to shelf stability of this mask. Rosehip Seed oil is a hot ingredient in skin care. It’s a non-greasy, super long chain fatty acid that’s full of vitamin A and other antioxidants and is a great ingredient for fine lines, photoaging, hyperpigmentation and so on. The essential oils smell great and are good for sensitive skin. For particularly sensitive skin use essential oils sparingly. The French pink clay with be gently purifying but with all these rich oils in the formula, it shouldn’t be overly drying. Shortcut Gentle and Moisturizing mask: Skip the cocoa butter and mango butter and just mix the other ingredients with some almond or sunflower oil and some glycerin. It won’t be fluffy, but it will be gentle and moisturizing. This mask features activated charcoal, a really powerful detoxifying and clarifying ingredient. It’s for acne, blemishes, blackheads and clogged pores or oily skin. This is an oil-free formulation, so it’s perfect for people with those issues. It might be too drying or feel a bit too harsh for someone with really sensitive skin or dry skin. When you use this mask, be sure to wash it off with a rag and not a nice towel. Charcoal is pretty messy and may stain your towels and washcloths. Shake, blend or whisk this mask well to get rid of the clumps of charcoal when you make it and before each use. If you make it with witch hazel, it will not require refrigeration. If you use water, you may want to refrigerate. This one feels like the classic natural mask to me. It’s loaded with herby smelling essential oils and the French green clay–it’s just so old-school. It’s not as rich as the the Gentle and Moisturizing Mask and strikes a bit more a balance between the drawing and tightening properties of the clay, and the rich, moisturizing of the oils. Jojoba is a protective, moisturizing wax that is really similar to the sebum produced by your own body. Vitamin E is a good antioxidant that is good for the skin as well as contributing to shelf stability of this mask. Rosehip Seed oil is a hot ingredient in skin care. It’s a non-greasy, super long chain fatty acid that’s full of vitamin A and other antioxidants and is a great ingredient for fine lines, photoaging, hyperpigmentation and so on. Carrot Seed and Clary Sage essential oils are some of the premiere essential oils used in anti-aging products. Ylang Ylang and Geranium smell great and are used to combat again as well. Some of these items can be found at the regular supermarket or your local co-op. Witch Hazel is usually available at Walgreen’s or CVS. Trader Joe’s is a great place to buy Jojoba and Vitamin E. Lots of co-ops carry a couple of kinds of clay, vegetable glycerin, quality Vitamin E oil and some butters and maybe some of the other ingredients in these masks. Below is a list of vendors I like who carry essential oils, cosmetic clays and bulk oils, among other things.